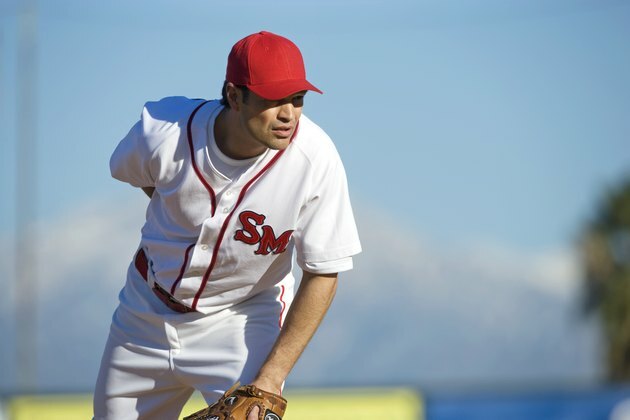 Shoulder pain in baseball can be a common occurrence among players. The overhand motion of throwing a baseball combined with the delicate nature of the joint can put it under stress. One of the first signs of stress in the shoulder is pain during and after pitching. The repetitive nature of throwing can lead to injuries. The rotator cuff consists of four small muscles that control the shoulder's movement. When the shoulder is forced through repeated, stressful motion it can cause a strain of any of these muscles in the rotator cuff. The repetition of throwing can cause pain and eventually lead to damage of the rotator cuff. When a players starts to feel pain in that area, he needs to stop throwing in order to reduce the stress that he is putting on the joint. The process of throwing a baseball can lead to shoulder fatigue. A pitcher will feel fatigue after a long outing because the shoulder muscles are not used to working and repeating the same motion under so much stress. Pitchers need to limit how much they throw the ball and stop at the first signs of fatigue or discomfort. The high torque involved in the throwing process -- particularly pitching -- can loosen the ligaments that attach the shoulder to the surrounding muscles. As this occurs, the pitcher can throw harder because he generates more torque. However, if the ligaments get too loose, the joint loses its stability and the throwing motion breaks down. This requires the player to stop throwing and rest. When a player has pain from throwing, the immediate cessation of the activity is required. In many cases, when a player stops the activity, the shoulder muscles will recover and the activity of throwing can be resumed after several days of rest. However, when injuries to the rotator cuff, labrum and other parts of the shoulder are severe, surgery may be indicated and months of rehabilitation exercises are required before the baseball player can start throwing again.